Her style has the soul and strike of 70s era Joni Mitchell mixed with the unfettered, brilliant timbre of Björk and a guttural delivery all her own. Watching and listening to Meghan sing is like hearing one’s own soul reflected through a blessed vessel. It comes from a fire-filled, compassionate place of purity. It is honest, elemental music. The Reverie Machine are the melody of a guided essence, a Bellingham band who epitomize the mystical heart of our unique community. Their artistic mission bears fruit intended to heal with musical soundtracks created to bring witness to our communal wonderment of spirit – when the veil is lifted and inner and outer worlds become one. It is not an easy task. 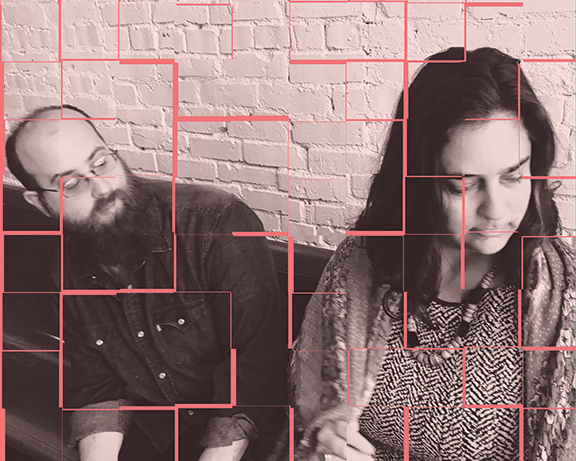 The husband and wife alt-folk duo of Meghan Yates and Mordechai Rosenblatt know all too well that life is a journey of contrasts: sloppy and pure, difficult and easy, old and new. But The Reverie Machine are here to remind us – there is beauty in all we do. We need only listen and participate to create the world we want to live in. The couple reveled in first date harmony, celebrated their first kiss with a co-written song born from the excitement. It was in this playful way that The Reverie Machine began. After a three-month courtship, the two were married. Their meeting, band and sacred union occurred in virtually simultaneous eruption. Unplanned spark became fire. For The Reverie Machine, their marriage and music are one. Mordechai, a multi-instrumentalist with DIY-punk roots, chose bass at the group’s inception. His intention? To support Meghan with a grounding instrument, as both husband and bandmate. He has since shifted to six string electric guitar, playing melodies that highlight his wife’s vocal subtlety and acoustic idiosyncrasy. As songwriters, they are passionate archaeologists. Meghan digs up the bones of a song. Mordechai brushes away the dirt. They do not aim for anything. The Reverie Machine take delight in uncovering mystery and allowing presence to be their guide. The group released two full length albums and traveled the US and Europe with a rotating ensemble which saw frequent member changes. On tour in 2013, they played The Subdued Stringband Jamboree and felt a pull to Bellingham like no other, vowing to one day settle here. An exhaustive cycle of travel and personal challenges ensued and by the close of 2014 the couple was grieving. Meghan had a miscarriage, her best friend was dying from cancer and the two had no place to live. They put faith in an inner voice, called to emerge from a dark cave. The Jamboree had created another spark. And their next move ignited the fire. They packed a car and came to Bellingham. Since arriving in town, Meghan and Mordechai have affirmed themselves by what they term “grace” – a practice of “stepping into energy received, not created, by listening and taking steps.” It informs their lives and music. They felt so inspired, the duo created a brand new record out Sept. 30 entitled, A Little Grace. The Reverie Machine’s newest album is a story about nature’s inherent contrasts which dominate our worlds. It is filled with songs of rebirth, resurrection, destruction and rediscovery, recognition of purpose, the divine feminine, true self and community. Mountains, canyons, caves and desert become characters in tales which honor our inner and outer realities. It is the story of life – a journey that can be hard and strange – but is what it is. With A Little Grace, we become witness to both shimmers and shadow, here to appreciate all the beauty of not knowing what may come. When Meghan became pregnant, there was only one name that came to mind – Grace. She stepped inside the grief, listened and chose to create the blessing she felt. This record is that special gift. Please come celebrate The Reverie Machine’s album release show on Sept. 30 at Presence Studio, 1412 Cornwall Avenue in Bellingham at 7 p.m. Many blessings of grace to you. For more about the band, visit www.meghanyatesand thereveriemachine.com. Enjoy the show on Sept. 30 at Presence Studio.